Yesterday evening the UK’s parliament voted to show that they had not changed their mind since December on a withdrawal agreement that hadn’t changed since December. Street artists have not been impressed with the political process over the past three months, nor indeed the past three years or so. “Bye Bye” says an anonymous artist who spotted a gate in Shoreditch conveniently painted EU flag blue. This flag with one member missing piece echoes Banksy’s enormous EU flag with a tromp l’oeil worker chipping away a star brilliantly greeting UK leavers as they depart through Dover. It was noticeable and disappointing how little political street art appeared during the 2016 Brexit referendum campaign. The most memorable from a very small entry list were these spoofs on the adverts for Banksy’s street art documentary “Exit Through The Gift Shop” lampooning Boris Johnson and Nigel Farage. Since then we have seen a ramping up of the Brexit street art as the unthinkable went from implausible to likely to now pretty much unavoidable. In the aftermath of the referendum result the immediate targets for street art scorn and derision were David Cameron, Nigel Farage and Boris Johnson, the architects and chief pom-pom wavers for the Leave cause. The political paralysis and consequential insertion of heads into the sand really gained a head of steam in December. I was recently obliged to take a few weeks away from the walls and pavements of Shoreditch and on resuming street meanderings last weekend I was bowled over by the amount of Brexit street art that appeared in that short absence. The duo Quiet British Accent belatedly brought George V into the debate. Theyen Rich aka Corrosive 8 deploys the sound political debating stratgey of making your opponent look simultaneously stupid and obscene, the Prime Minster’s watersports would certainly rate triple X. He also borrows the buses to nowhere from anarcho-punk artist Jamie Reid and adds a Carrie Reichardt slogan. Benjamin Irritant’s rabbit asks a very pointed rhetorical question, is it great again yet? The Misfortuneteller has developed a witty street cartoon style in the past couple of years, this largest piece to date borrows its style from a closing down sale, its simplicity belying the fact that it is emphasizing the gap between the Brexiteer’s promises of “the easiest trade deals ever negotiated” against the visibly increasing isolation the country faces with borders and barriers hardening, no deals and inward investment evaporating. Subdude, producer of a lot of Brexit related art over the past few years, has deviated from his usual distinctive style of political humour on flat colour blocks to deliver a hand drawn condemnation of petty sectarian spats, photos and cartoons on newspaper pages make it clear who is the target of the jibe. Apparently Subdude has put six out on the streets but so far I have only found three, one of which overlays a political cartoon illustrating Theresa May and Jeremy Corbyn both facing a common dilemma, Brexit actually threatening to irreparably split both of the UK’s main political parties. Ironically, in order to placate their parties both are having to turn away from the fact that neither actually supports the position they politically obliged to adopt, we live in weird times. Cigarette packet health warnings have been used as the basis for political street art for over 10 years, in fact almost since the regulations came in in 2003, think K-Guy in the mid 2000s. Wanker’s Of The World, whose mission is to identify and award that sobriquet to suitable candidates in the public eye are responsible for enormous cigarette packets mocking the main proponents of the Brexiteers. There are apparently 6, we located 5 in the past week. Ironically, the adoption of those cigarette packet warnings is actually an EU law which mandates the format, size and range of messages in all EU countries. Who knows what the monkeys in the chamber are going to do next, certainly they don’t! This entry was posted in News and tagged Banksy, Benjamin Irritant, Brexit, Brexit art, CodeFC, London, MCLN, Political art, politics, Quiet British Accent, Shoreditch, Shoreditch Street Art TOurs, Street Art, Street Art Tours, subdue, The Misfortuneteller, Uberfubs, Wankers Of The World on 03/14/2019 by Shoreditch Street Art Tours. Jonesy Art: Two Heads Better Than One? In the mind of an obsessive street art spotter things get little more exciting than the chance discovery of new art by Jonesy. Two new pieces have appeared recently which raise the bar for sculptural street art. The first features a dragon fly pinned to a three headed character. The second has what appears to be a pair of Titan beetles, the largest insects in the world against a pair of faces. Both of the pieces are called Pesticides and both have multiple heads which represent the conflict inherent in our collective agri-industrial choices. Pesticides harm the environment and kill animals, they percolate up the food chain and accumulate in our bodies, yet without them we can’t produce enough food to feed our ballooning population. Having had the chance to ask Jonesy himself about the meaning of multiple headed creatures within his art it is interesting to revisit some older specimens starting with this classic Tar Sand Nightmare piece, Tar Sand oil production being the incredibly polluting, energy intensive, expensive and land destroying oil production favoured in Alberta, Canada and elsewhere. That piece is phenomenally resilient. It lost its Native American/Aboriginal Canadian headdress, other artists occasionally paste over it yet it survives and recovers, outlasting the temporary indignities foisted upon it. Earlier this year a painting of a double headed creature smothered in toxic air pollution appeared in Shoreditch, the dilemma here being between the damning choice between petrol (CO2 pollution) and diesel (NOx) combustion. Back in 2014 this Genetically Modified Organism appears to be a kind of mutant Siamese twin. This entry was posted in News and tagged castings, environmentalism, Genetically modified Organism, GMO, Jonesy, London, pesticides, Sculpture, Shoreditch, Shoreditch Street Art TOurs, Street Art, Tar Sand Oil, Tours on 08/29/2018 by Shoreditch Street Art Tours. Shoreditch Street Art Tours returned from a short break in foreign climes to find a street art “Where’s Wally?” challenge on the streets of Shoreditch, courtesy of French street artist STRA. 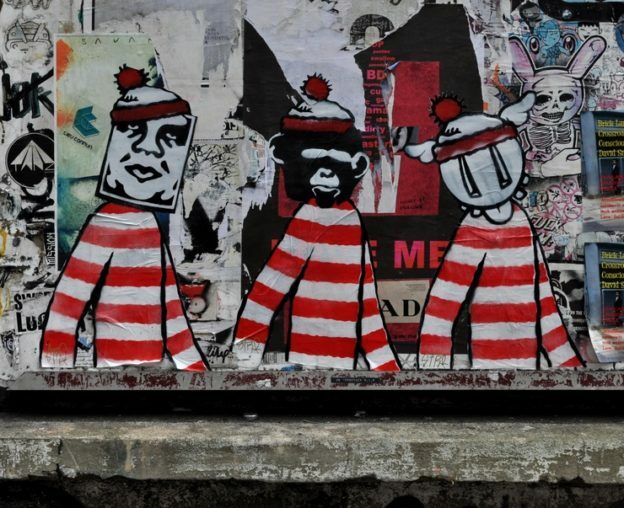 This was a Wally hunt with a difference with three of the World’s top street artists being portrayed as the elusive Wally. A word of warning, this blog post turned into an excuse to dig through lots of old images of some of my favourite street artists so prepare for some gratuitous street art history! “Laugh Now” is a classic Banksy monkey image and from the photo of the silk screen print version below, photographed at Steve Lazarides’ “Banksy Unauthorised Retrospective” exhibition in 2014, you can see exactly which Banksy image Stra has drawn from. The only genuine Banksy monkey I have photographed on the street is this monkey detonating a bunch of bananas photographed in 2006 but even Banksy has spoofed himself as a monkey as seen in 2010 in the film poster for his street art documentary “Exit Through The Gift Shop”. Shephard Fairey, popular around the world, most famously for his Obama “HOPE” poster, itself subject of more parody copy versions than you might imagine, is also a street art Where’s Wally. Alongside the Obey Giant paste ups on the back of the road sign by Shep Fairey in the photo above is a D*Face paste up, D*Face has also been Wallified! There are more out there, good luck with your Where’s Wally hunt! This entry was posted in News and tagged Banksy, copy, D*Dface, DFace, Humour, London, parody, Shepard Fairey, Shoreditch, Shoreditch Street Art TOurs, Stra, Street Art, Where’s Wally on 09/10/2017 by Shoreditch Street Art Tours. Coming To A TV Screen Near You! Just a little heads up, on 27th February – which at the time of writing is tomorrow – Bargain Hunt on BBC 1 features Shoreditch Street Art Tours guide Dave showing presenter Natasha around some of the street art delights in the area around Spitalfields Market. This entry was posted in News and tagged Bargain Hunt, Dave, Natasha Raskin Sharp, Shoreditch Street Art TOurs, Spitalfields Market, Street Art on 02/26/2017 by Shoreditch Street Art Tours. Many thanks to the great team at Culture Whisper for featuring Shoreditch Street Art Tours as one of the coolest things to do in London in 2017. It’s an honour to be included among some recommendations for events sure to make London buzz this year. Check the schedule online to see when the tours are running and we look forward to seeing you sometime soon. This entry was posted in News and tagged Alternative Culture, Culture Whisper, London, Shoreditch Street Art TOurs, Tried and tested on 01/12/2017 by Shoreditch Street Art Tours.